Our community Outreach coordinator arranges teaching opportunities for elementary schools within the city of San Diego where visual arts programs are limited or non-existent. Prepared with all necessary supplies, our volunteer teachers and aides visit numerous excited classes during school hours as well as many after school programs. At the end of each visit, we often donate paint sets and brushes, and leave a packet of lessons to be used by site instructors. In addition, our teachers visit many senior centers, teaching these enthusiastic adults the ins and outs of watercolor painting. 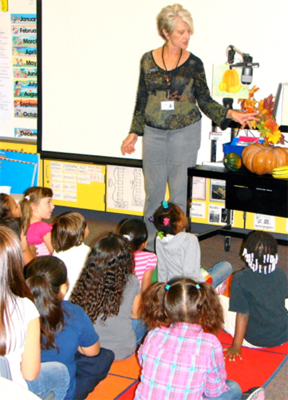 Our Outreach Coordinator introduces a fall watercolor lesson to 3rd graders from Normal Heights Elementary School. We always get a great reception and have an enthusiastic audience!! 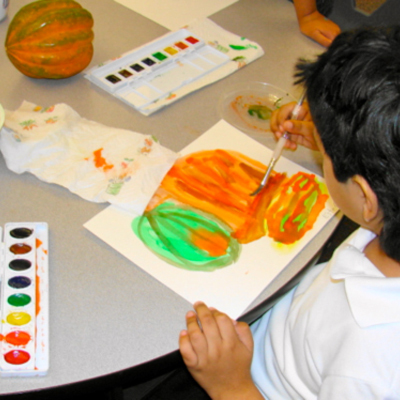 Using real pumpkins and squash, students learn about the properties of watercolor as well as learning how to be good visual observers. 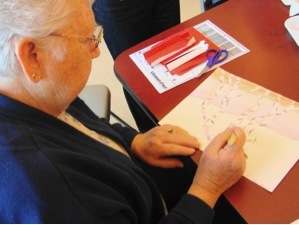 Seniors from the Renaissance Senior Center enjoyed painting a crayon resist grove of birch trees against colorful watercolor wash backgrounds.